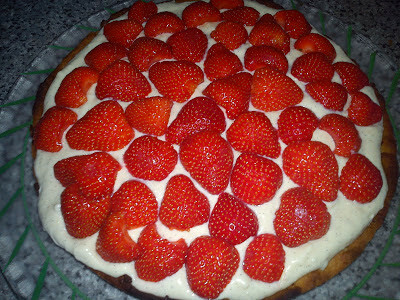 I am getting closer and closer to making the ultimately strawberry cake !!!! The last two years I have been working with and fine tuning the cake bottom layer, which is perfect. So now I have decided to take yet another step towards the ultimately strawberry cake. When I found as well as tasted this vanilla cake cream from the recipe “Medaljer med roser” in the great bake book “Hjemmebagt”, which turned out to be tasting pretty amazing, I knew at once, that I had found the vanilla cake cream for the ultimately strawberry cake. The next step for me to work with is the glazing top, which will the finishing touch to the ultimately strawberry cake on top of the fresh strawberries. Hopefully I will be able to finish this part of the cake during this summer. Remove the vanilla corns from the vanilla pods. Whip the egg yolks, sugar and maize starch together. Remove the vanilla pods from the hot milk. Pour the hot milk into the egg yolk-sugar mass, while you whip. Afterwards add the entire mix back into the cooking pot. Continue to whip this mass, while it is heated up and thereby thickens. Whip and heat until the mass is thick. Stir the cold mass and lightly whipped dairy cream together into a homogeneous mass. Store the vanilla cake cream for minimum 4 hours. Celebrating my birthday this year I decided to have a lady´s lunch, where the dress code was hats. Keeping it simple for myself I decided, that the menu should be “smørrebrød” (= open Danish sandwich made from rye bread) and the “smørrebrød” should come from the restaurant being awarded the best Danish lunch restaurant of 2012, which is “Remouladen” located in Vejle. 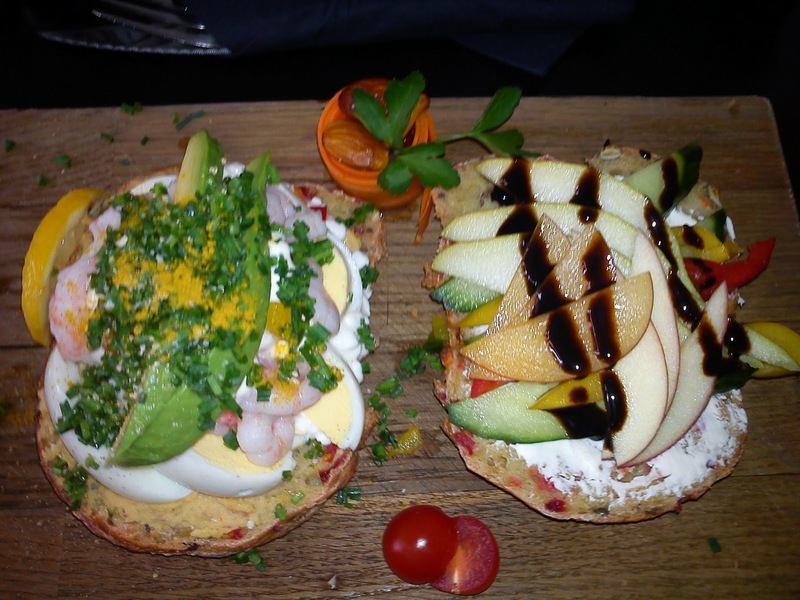 Here you can buy “smørrebrød” from a take-away menu, where each piece of “smørrebrød” cost 48 DKK. 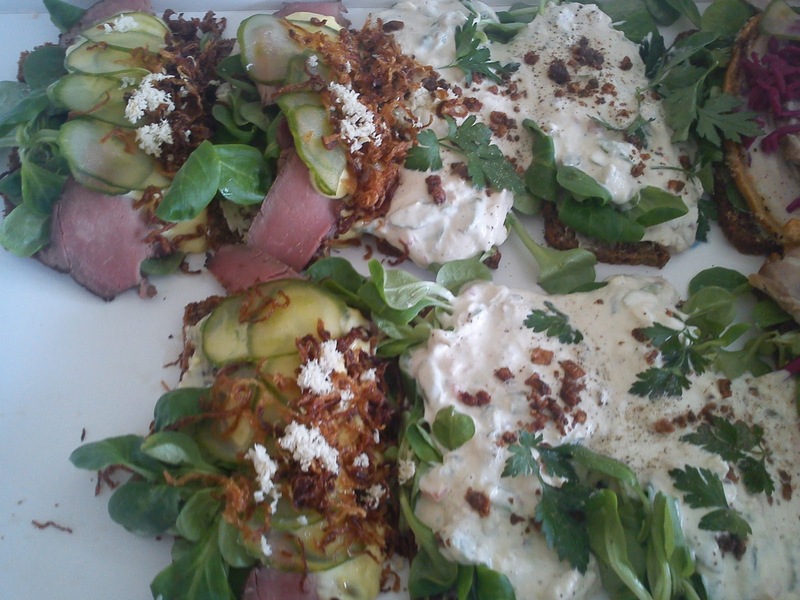 All the various version of “smørrebrød” is made from home-made rye bread, the taste was excellent and the view/look of each piece was wonderful. So it is not the last time, when I will be enjoying “smørrebrød” from Remouladen. 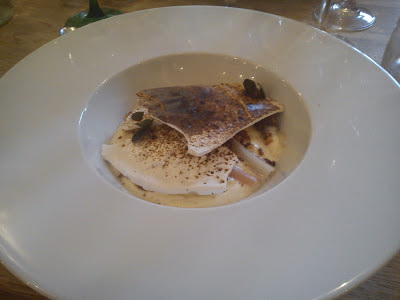 Actually I have been eating at lunch at Remouladen back in September 2012. So not “wasting” my time on making the food I decided to go all in on the birthday cake for this lady´s lunch making home-made strawberry cake from the very bottom almost to the very top of it, well I did not grow the strawberries myself, they came from Belgium, as the Danish strawberries was sold out. So I both baked the bottom layer of the strawberry cake and made the vanilla cake cream myself. And the cake taste delicious and every single piece was eaten with big pleasures of the ladies at the lunch. I really enjoy my birthday having time to talk to all my guests and I got some great birthday gift including two new cake books. So a big thank you to all my good girls friends for making this a great day for me. It was my birthday last week, so tradition demands that you bring cake to work to share with your colleagues, who returns the favour by singing the Danish birthday (I dag er det X´s fødselsdag) song, which is NOT the usual “Happy birthday” as it is in some many other countries. As the rhubarbs are growing and growing in my garden as well as in the gardens of friends and colleagues, it is very easy to get hold of fresh rhubarb for free. And as Greek yogurt somehow has played an important role in my work life the last couple of weeks, I knew at once seeing a recipe called rhubarb trifle with drained yogurt in the cooking book called “Mormor´s mad” (= Grand mother´s food) by Camilla Plum, what I wanted to work with a combination of rhubarb and Greek yogurt for my birthday cake. After storage the layer of Greek yogurt with icing sugar inside has firmed up into a cutable texture. Last I made version of rhubarb tiramisu. Heat the (conventional) oven to 200’C. Cut the rhubarb stems into smaller pieces and mix them with sugar, vanilla corns and vanilla pod in oven stable form. Bake the rhubarb –sugar mix at 200’C for 10 minutes, stir the mix and bake until the rhubarb pieces are just soft enough. Cool down the rhubarb mix. Remove the vanilla pod and separate the rhubarb juice from the rhubarb compote. Adjust sweetness in the rhubarb juice with more sugar, if needed. Stir Greek yogurt and icing sugar together, you can use less icing sugar, if you want a more fresh/acidic yogurt, but keep in mind, that the rhubarb compote is also acidic in taste. 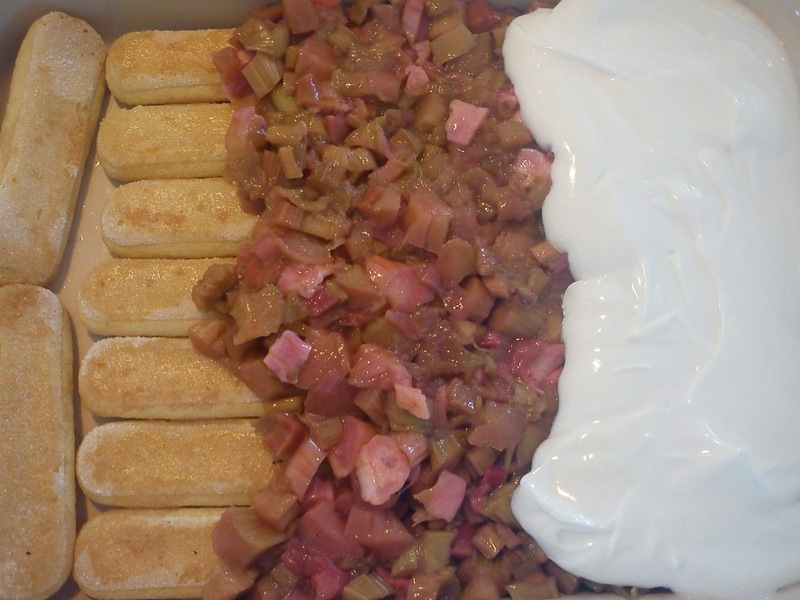 Start by filling the bottom of a baking tray/dessert form with lady fingers. Add a small amount of rhubarb juice on top of these lady fingers. Save the rest of this rhubarb juice for later mixing with water, wine or sparkling wine. 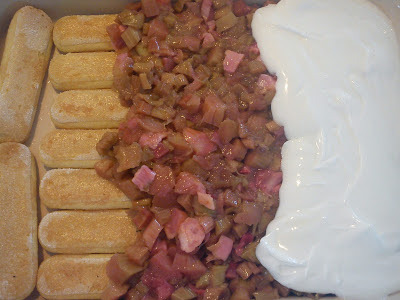 Cover the lady fingers with rhubarb compote. And add the sweetened Greek yogurt on top of the rhubarb as the final layer in the rhubarb tiramisu. Cover the form with cling film and let the cake rest for minimum 4 hours in the refrigerator or night over (I did this). 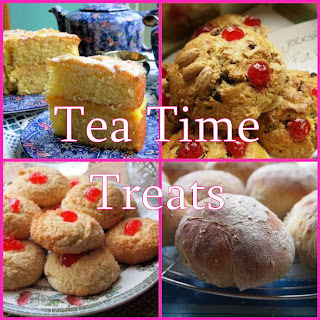 It is always with great pleasure, that I participate in the virtual blogging event “Tea Time Treat” hosted by Karen from Lavender and Lovage and Kate from What Kate Baked. And I was not in doubt what to bake, when Karen announced the theme to be biscuits and cookies. For a Dane biscuits can be both sweet as well as savoury. 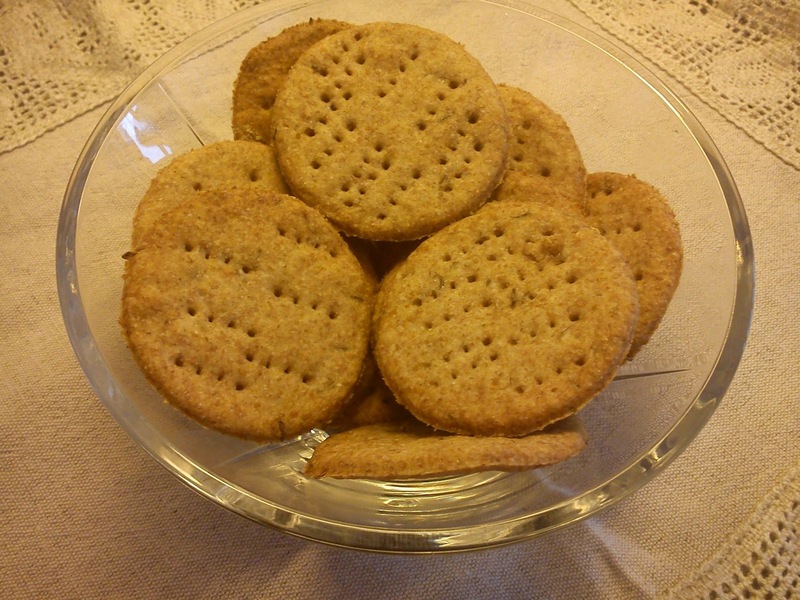 The savoury type of biscuits are typically eaten together with cheese here in Denmark. 1. Mix the two flour types together. 2. Cut the butter into small pieces and fast crumble it into the flour. 3. Add anise, salt and bicarbonate into the butter-flour mix. 4. Add the water and knead the biscuit dough into a homogeneous mass. 5. Cover the biscuit dough with cling film and let it rest for minimum 1 hour in the refrigerator. 6. Heat the oven (conventional) to 200’C. 7. Cover the table with flour and roll the biscuit dough as thin as possible with a rolling pin. 8. Cut out the biscuit in desired shapes, and pinch the biscuit with a fork. 9. Place the biscuits on baking trays covered with baking paper. 10. Bake the biscuits in the upper part of the oven at 200’C for 10-12 minutes. 11. After baking cold down the biscuit as fast as possible. 12. Store the biscuits in air tight containers. Medaljer med roser - medals with roses - from "Hjemmebagt"
After a period of standstill on my way of baking every single recipe in the bread book "Hjemmebagt", another little step has been taken to fulfil this "mission". This time I have been making a cake called "Medaljer med roser" (Medals with roses), which is a traditional Danish cream cake. My reason for trying out this specific recipe is, that I needed to test out a vanilla cream, so I can make progress on creating the very best strawberry cake, building on top of strawberry cake version 3.0, as my birthday is approaching very fast bringing guests around for a birthday celebration this upcoming week-end. Well back to these Medaljer. I had some difficulties in rolling the pastry dough into equal height, so I had look at regular time into the oven removing the individual pastry piece one by one, as they were baked finished. 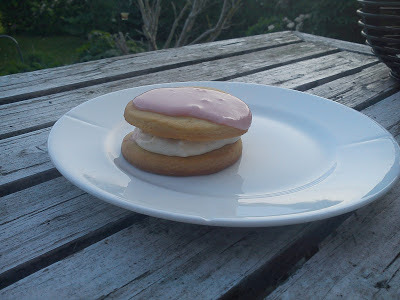 The vanilla cream was more easy to make, that I had imaging. Besides from the vanilla cream the cakes also contains marinated strawberries in rose extract and orange juice. The remaining marinate is afterwards mixing with icing sugar for the glazing of the top part of the pastry piece. I also had to involve some of my neighbours, as I ended up with 12 medals, which needed to be eaten within a quiet short time frame. And they have returned with some very positive comments to the taste of these cakes. 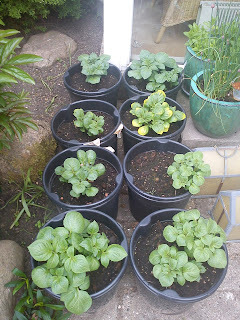 One week after my potatoes were popping their heads up in kitchen garden, they are having full speed on their growth, almost getting bigger and bigger day after day. 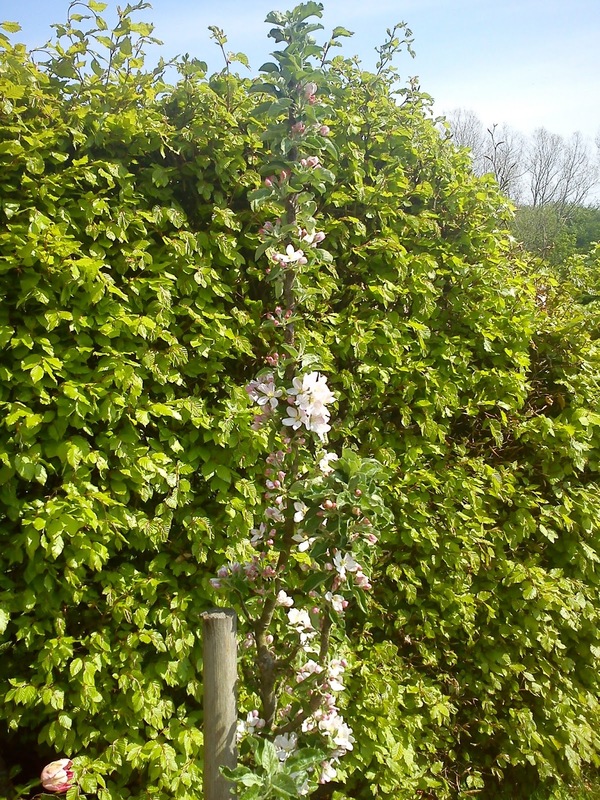 Besides from full speed on my potatoes, the two apple trees in my garden are in full bloom with their beautiful flowers, really bringing life into my garden. 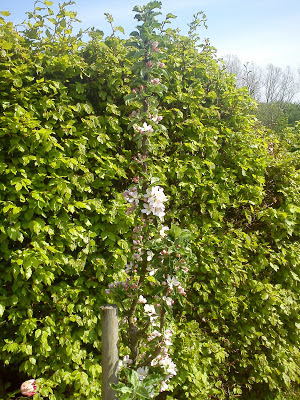 My "big" apple tree are living in symbiosis with various rhubarbs and one raspberry plant in one corner of my little park. 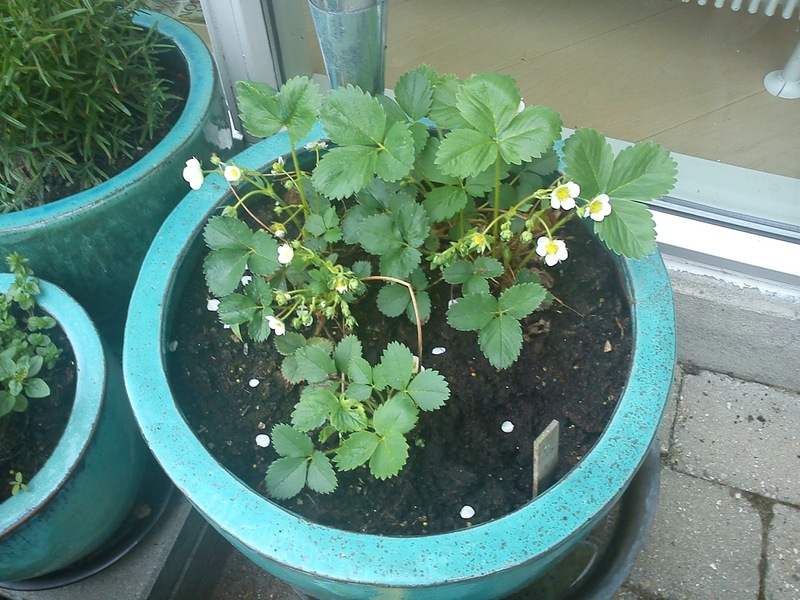 Among my herb pots three strawberries are also showing their small flowers bringing promises to me about future freshly harvest strawberries from my own garden. 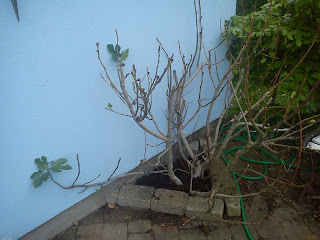 The only plant not really participating in this spring time for full volume is the fig tree, how was been through yet another very cold winter in my garden. I imaging the fig is considering if, it will active or not this year bearing fig fruits. I and the fig are hoping for some warm weather this summer. 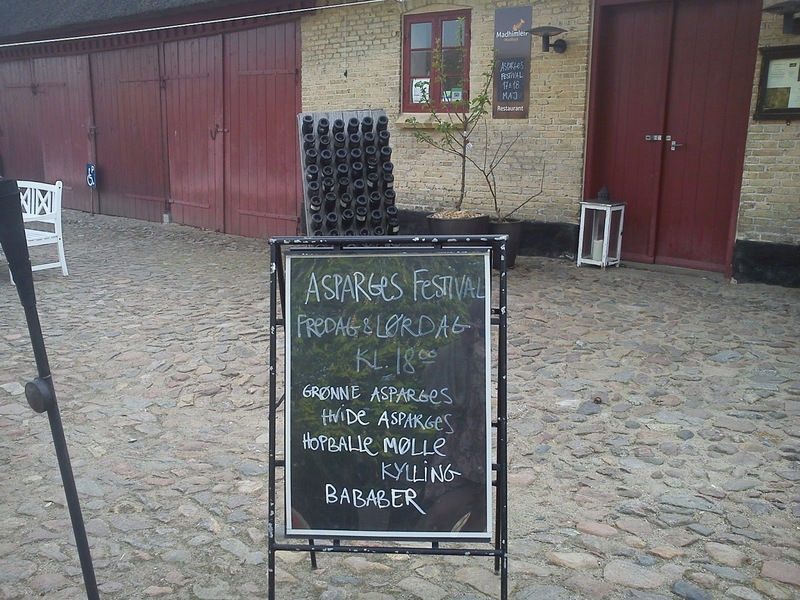 Welcome to the asparagus feest at "Madhimlens Madhus"
Yesterday evening I went to the annual asparagus feast at "Madhimlens Madhus" together with my very good friends from Horsens as well as my cousin. 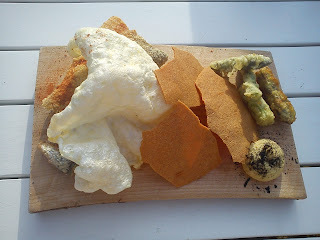 The feast started out in courtyard with a glass of champagne and cutting board full of fried salmon skin, pig skin, cheese biscuits, asparagus in tempura dough and a kind of humus with burned pepper on the top. I likes most of these thing, but not the salmon skin, which really was tasting of fish, big surprise being the skin of a fish. 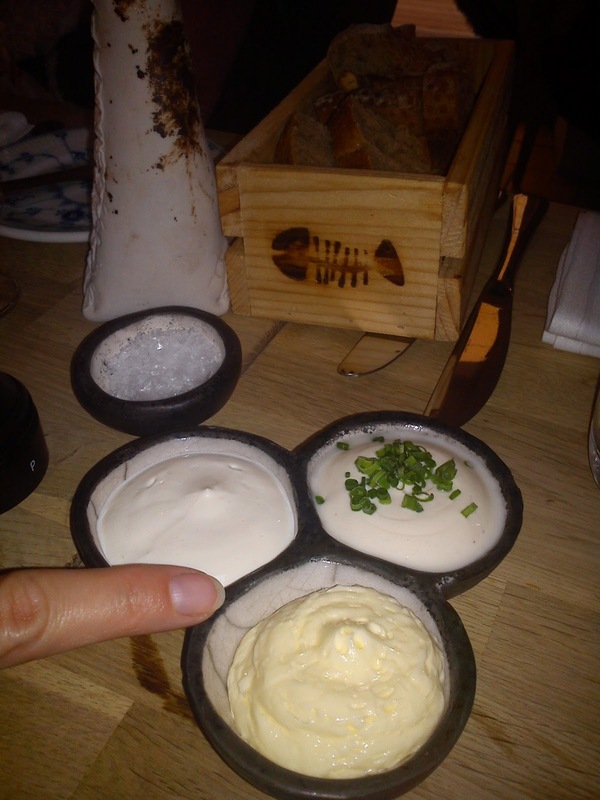 Well seated in the dining room we were served various types of bread together with whipped butter (whipped together with yogurt for extra freshness), smoked cheese and fresh cheese dip. 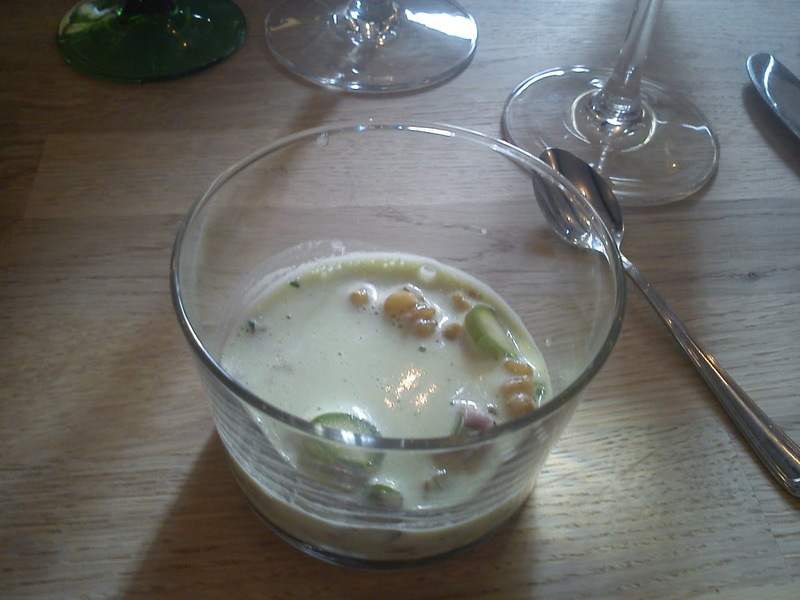 As a small appetizer we started off with thinly cut green asparagus and fish served in a parsley infused cream sauce. 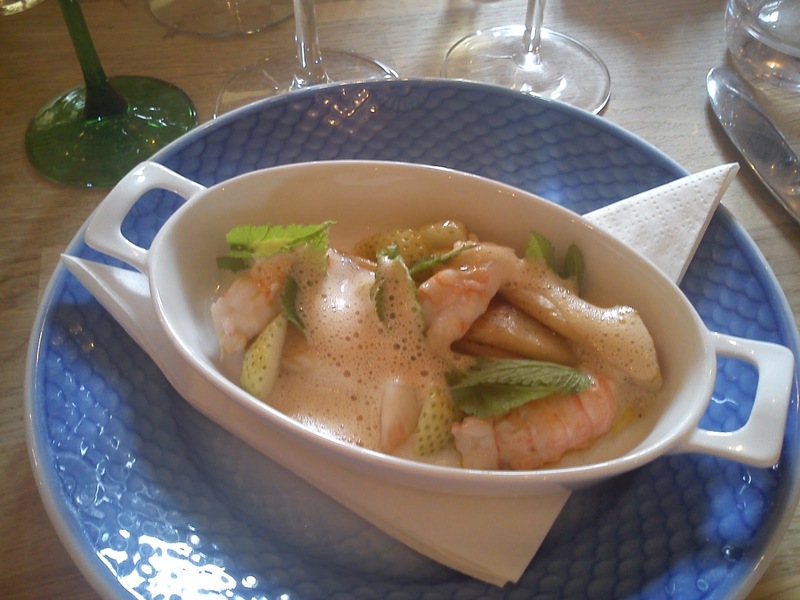 As the second starter we got fried white asparagus, Norway lobster, green strawberries, deaf nettle topped with a whipped thin sauce. 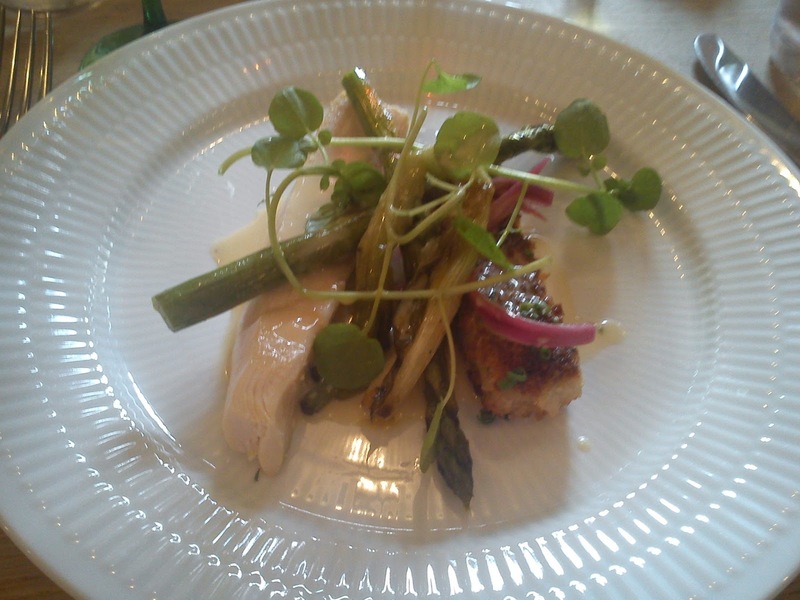 Another beautiful looking dish. The main course was chicken from Hopballe Mølle, grilled green asparagus, spring onion, marinated red onions, wild watercress and asparagus sauce. For this meal I was paying 575 DKK incl a small wine menu (four small glasses of wine). I will give this experience 5 stars. A little closing remark: eating asparagus brings it´s own odor to your liquid out-put, so imaging the odor in restrooms in a restaurant, where the entire guests have been eating asparagus !!! An excellent and easy way to have a meal during spring time: white German asparagus & dried Spanish ham. Asparagus is one of my favourite vegetable, regardless of them being green or white. Last week-end I went to Flensborg with my good girl friend from Horsens on our yearly asparagus trip to by the white asparagus, which are not so normal to find in the Danish supermarkets. You can serve this dish either as a starter or as main course. I enjoyed this plate as my evening meal. 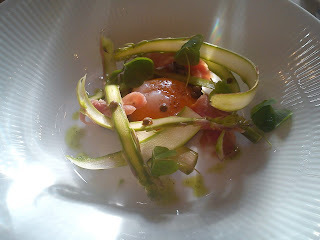 I am really looking forward to this evening, where I together with my good friends from Horsens will participate in an asparagus event at Madhimlens Madhus filling myself with asparagus, uuuhhmmm :-) And I will take pictures of the various dishes for you to have a look very soon. Start by snapping off the lower end of the asparagus followed by peeling them from top to toe. I use a potato peeler for this. Heat water in a cooking pot to the boilling point. Add the asparagus and boil them for approx. 5 minutes. Remove the asparagus from the boilling water. 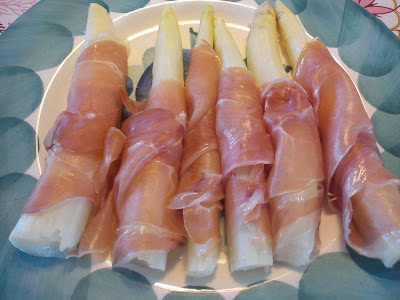 Wrap dried ham around the asparagus - using one slice of ham for one stem of asparagus. 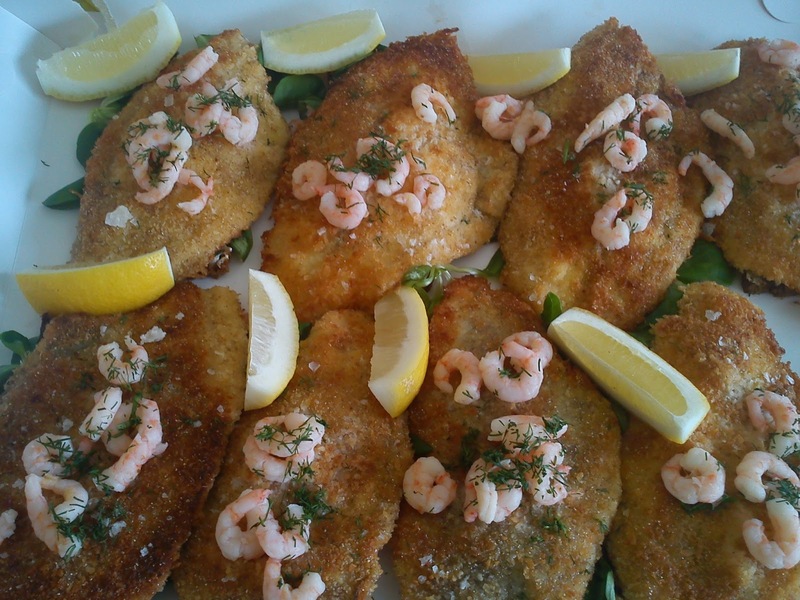 Serve right away together with a glass white wine. I have found this specific recipe on Perch Hill Rhubarb cordial created by Sarah Raven in the Country Living issue May 2013. 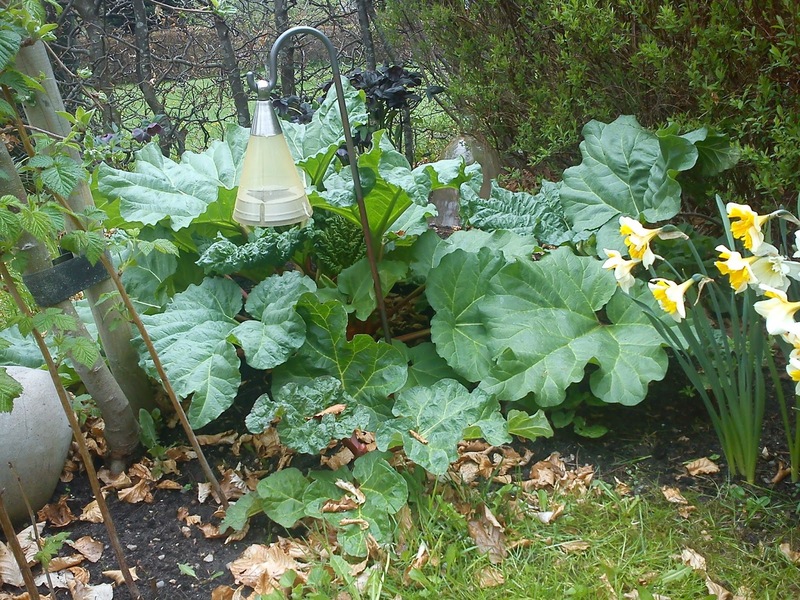 And more and less at the same time my good friends living in Horsens shared some photos from their garden with me, and here I noticed rhubarb in full growth. 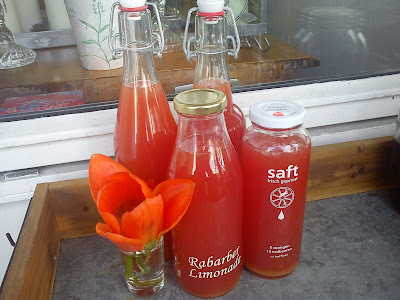 I took this a sign, that it was about time I made this season first rhubarb cordial. My own rhubarbs are also growing, but they are less abundant, so I need a good starting portion from my friends´ garden in Horsens, which were delivered in person by my good girl friend. If you wonder, why I have placed tulip heads in the cover picture with the rhubarb cordial, the reason is very simple. Hannibal the Cat, my BIG garden lion with a fighting weight of 7 kg, which is a big mouse hunter is also keen on bitting of the tulip heads of the growing tulips in my garden. You should really try this rhubarb cordial, it has a great taste with an elegant touch of star anise. Cut the rhubarb stems into larges pieces, into pieces of 2 cm. Add water and rhubarb into a the cooking pot. Add orange peel, orange juice and the star anise. Cook it up and left it simmer gently for 5-10 minutes, until the rhubarb stems starts to look like rhubarb mash. 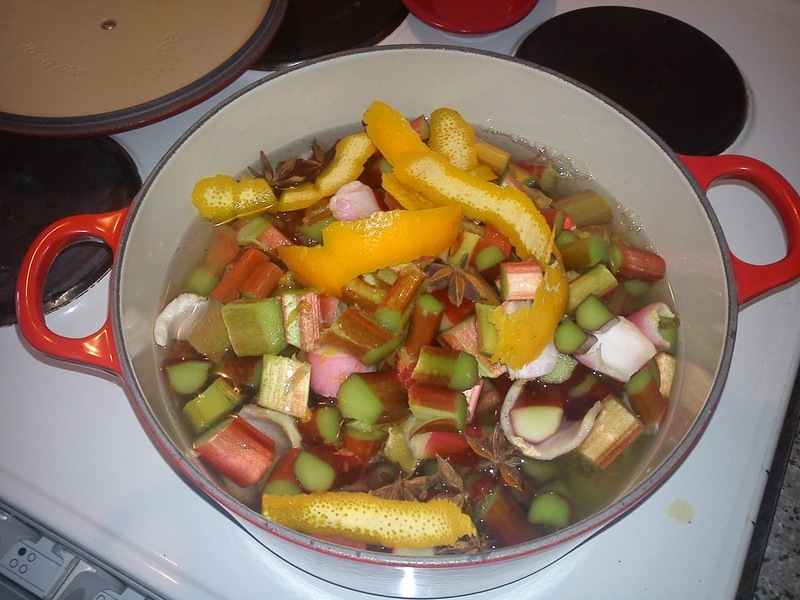 Remove the rhubarb pieces, orange peels and star anise from the cordial part using a sieve. Mix rhubarb juice, lemon juice and sugar together, small addition of each ingredients, so you can adjust the sweetness and freshness to your desired preference. Place the cooking pot on low heat and only heat up until, the sugar has been dissolved. Store the rhubarb cordial in the refrigerator or freeze, as no anti-microbial have been added. 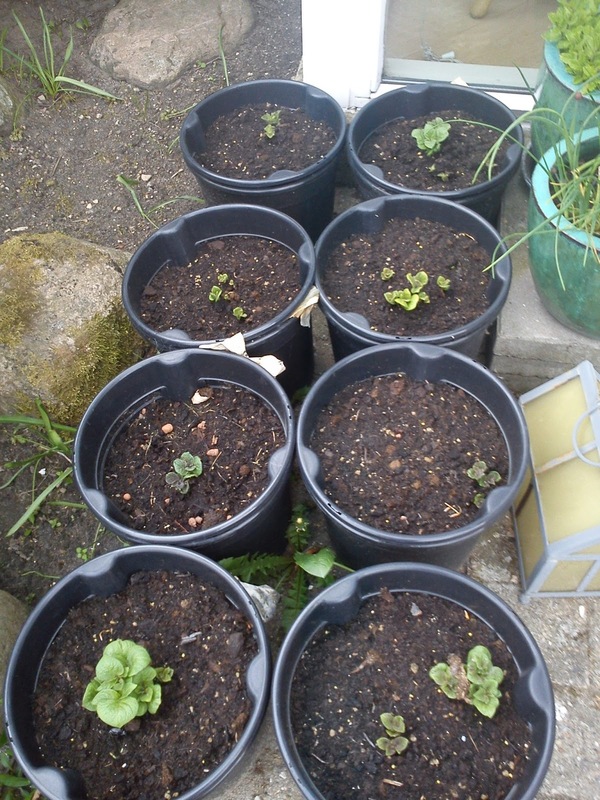 17 days after I have been planting potatoes in some special potato pots, they are clearly popping up their "heads" above the soil surface. 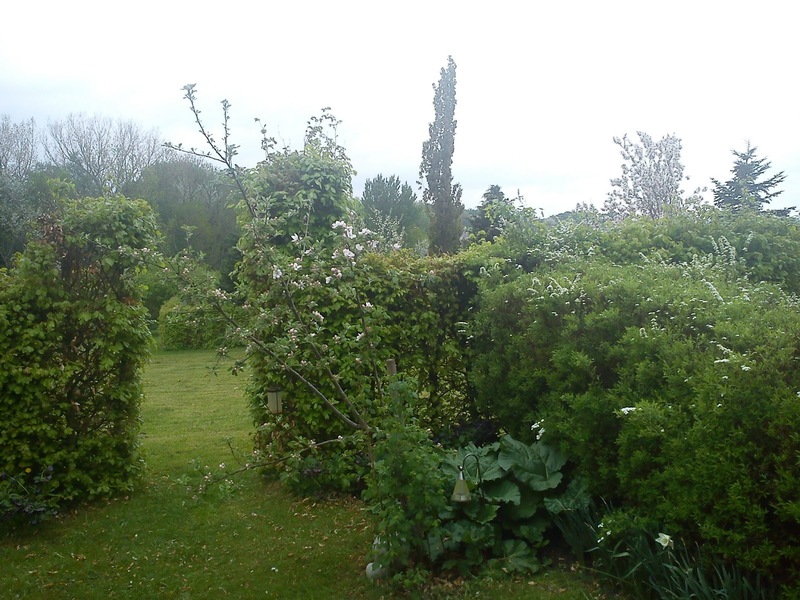 It is so rewarding to see the growth of vegetables, which you have planted yourselves instead of just buying everything in the supermarkets. Since I have been re-potting my various herbs late April, two new herbs have been moving into empty pots. 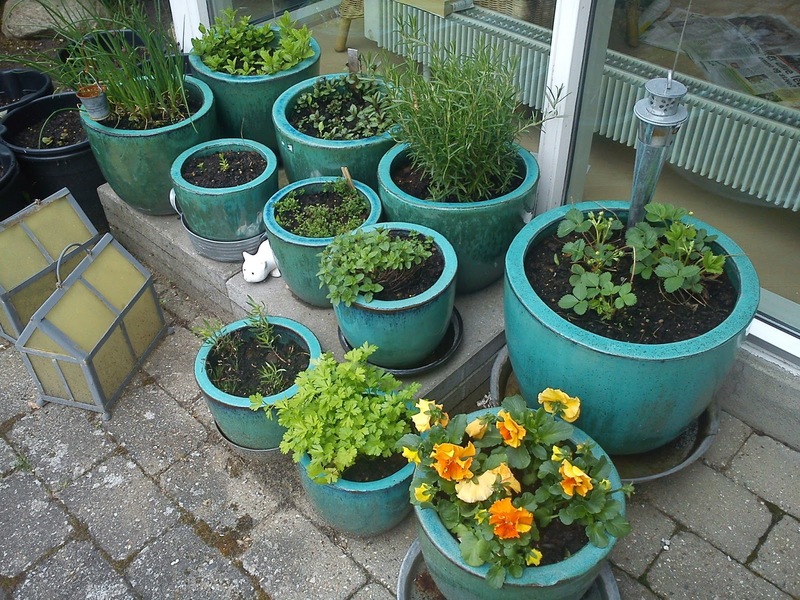 So now flat-leaf parsley and rosemary are members of my "herb family". I found a "real Dr Oetker recipe" in the latest issue ( issue 3/ 2013) of the magazine Isabella. By real Dr. Oetker I mean, as almost every second or third ingredients is Dr. Oetker ingredients such as the almond flour, vanilla sugar, baking powder, raspberry extract and decoration sprinkles !!!! Anyway, I have never baked the cake called Hindbærsnitte (Raspberry Cutting), so I decided to test this recipe out. In my opinion the amount of the raspberry extract into the icing sugar could be reduced into ½ amount, as the overall flavour profile becomes a little to perfumed accoring to my taste preference. Mix flour, almond flour, sugar, vanilla sugar and baking powder together in a mixing bowl. Cut the butter into smaller pieces, which is crumbled into the flour mix. Afterwards add the cold water and knead the dough fast together. Meanwhile mix the raspberry jam and raspberry extract together. 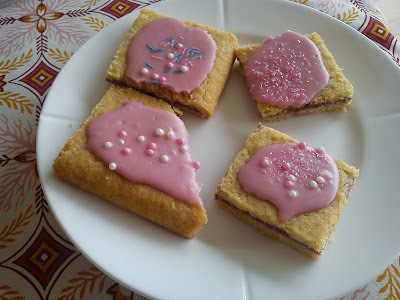 Mix the icing sugar, raspberry extract and water into a icing layer, which should cover the upper part of the cake together with decoration sprinkles. Cut the cake into smaller pieces. 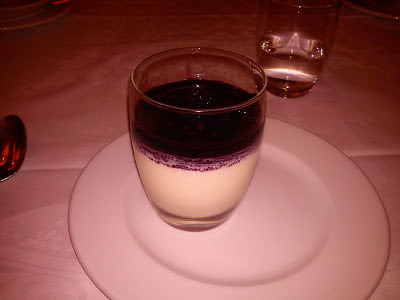 When I am in Paris, I normally try to enjoy an evening meal (if possible to the agenda) at the restaurant called Le Congrès Maillot. 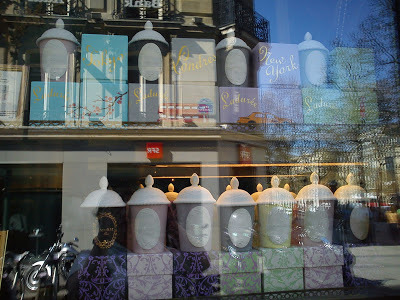 For me it is traditional French style restaurant, which has some very friendly waiters. This time I decided a Kir Royal as my starter, as I located a calorie loaded dessert as the finishing touch to this evening meal. As main course I as usual I choice scallops, which I have eating at many occasion at this restaurant, as they big and perfect in texture. 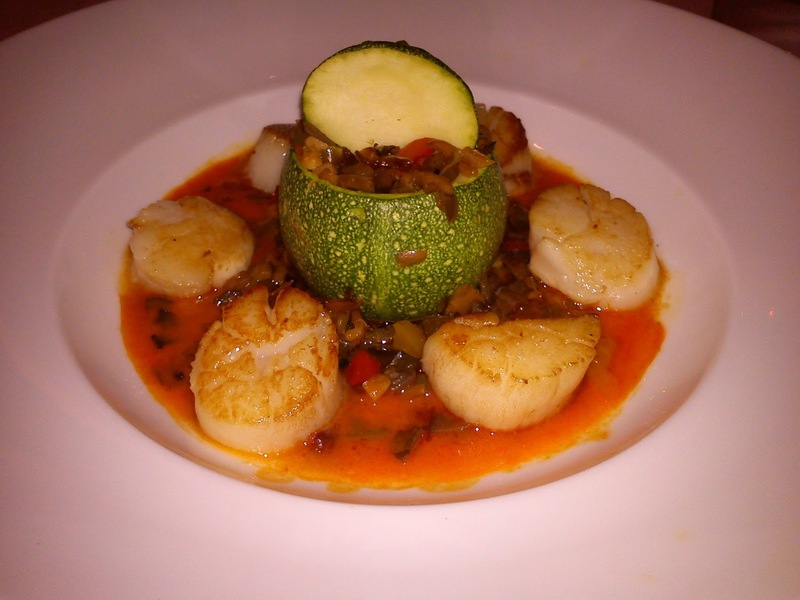 This time the scallops was served together with a small hollowed zucchini with various vegetable in a light tomato sauce containing some more vegetable. Uuuuhmmmm !!!! As the sweet part for this evening meal I had an excellent panna cotta topped with a red fruit sauce. For this meal I was paying 59 € incl. one glass of wine. I will give this experience 4 stars. 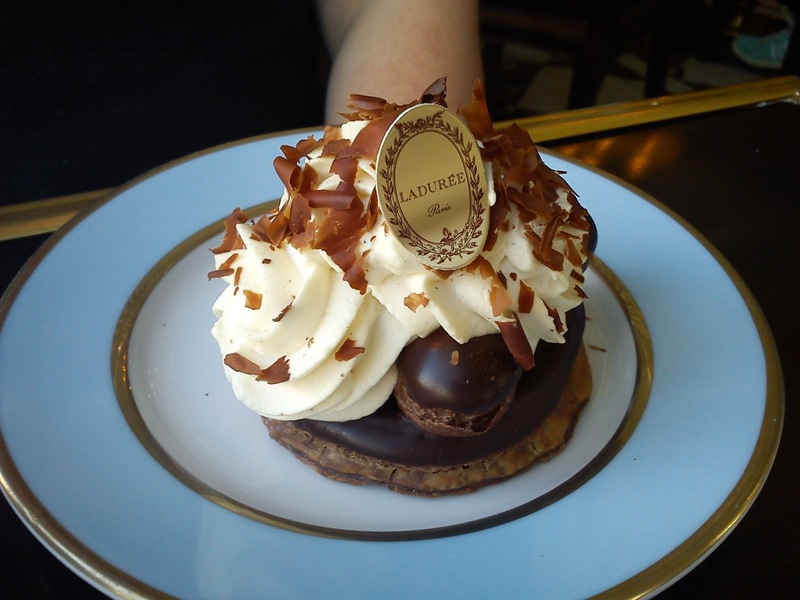 Using the opportunity of having some hours free from work during a visit to Paris I decided to revisit Ladureé together with a good work colleague to enjoy some afternoon tea. 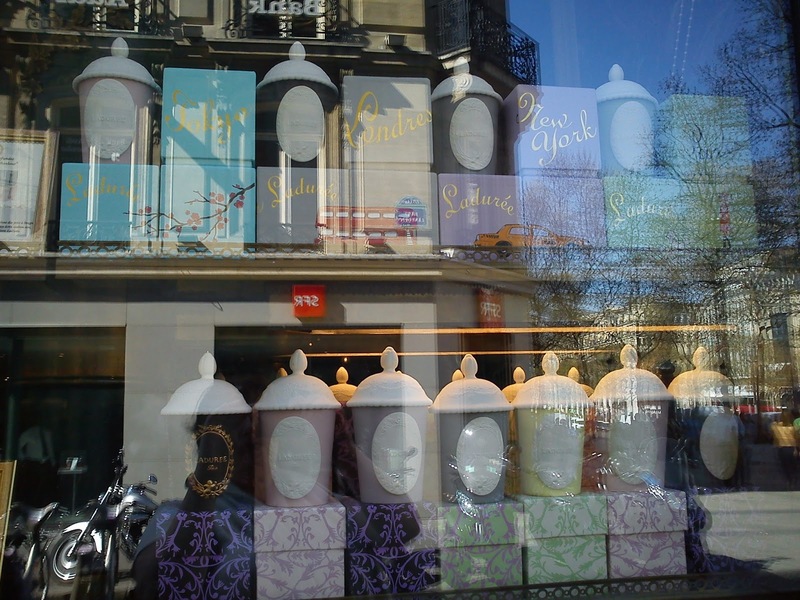 The windows at Ladureé are always very nice decorated just like their cake, so a trip worth on their very own. 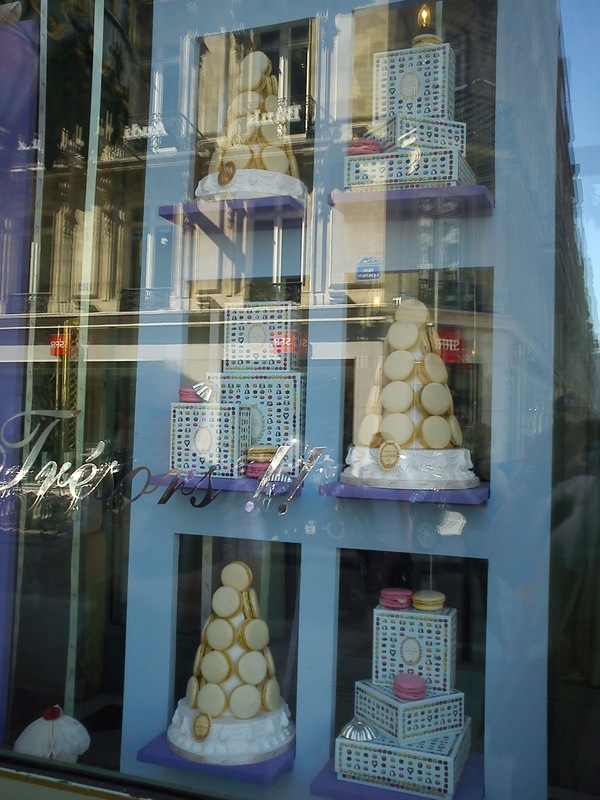 However, if you have the time you should really go inside and enjoy some of the excellent cakes, either as their or take them with you. 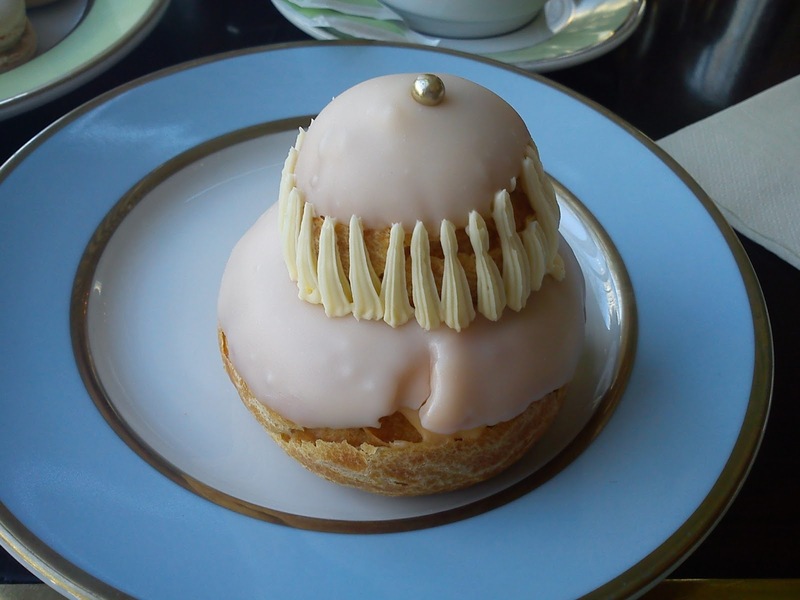 For my part of the afternoon I selected a cake called "Religieus à la Rose", which is a cream puff pastry with rose petal custard cream and raspberries. This cake really looks like a crown. Together with my cake I also selected two mini macaroons. 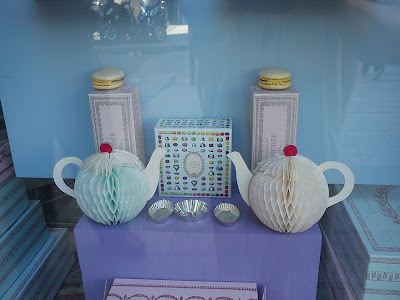 As tea I selected a tea called "Thé Joséphine", which is a Chinese black tea wrapped in tangerine, grapefruit, orange and lemon, delicately enhanced by a ring of jasmine flower. An amazing wording for a cup of tea. 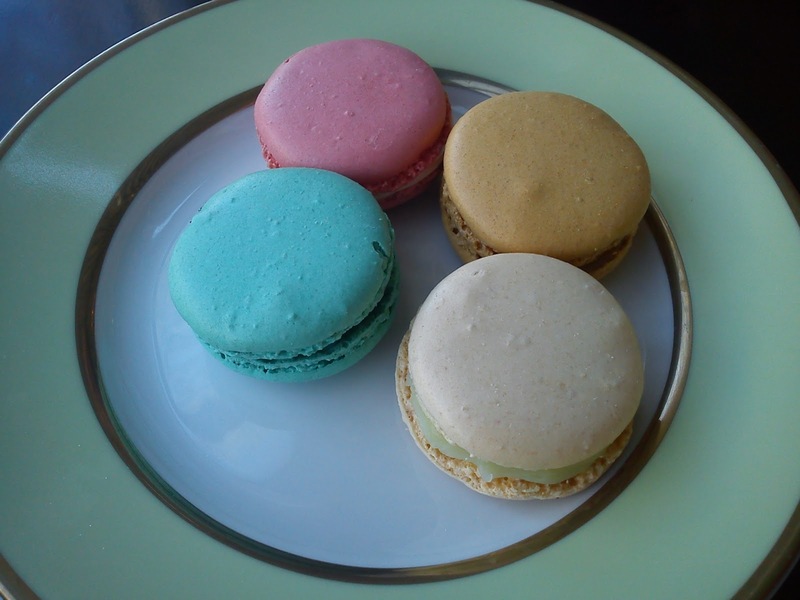 For a pot of tea, one and two mini macaroons I paid 20 €. It is an OK value to pay. I will this experience 4 stars. 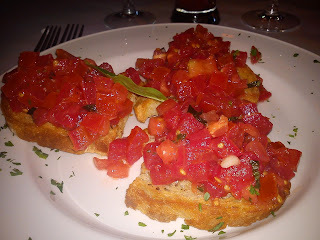 During my stay in White Plains, New York, I also had the opportunity to have dinner at Serafina. This evening was a much bigger success, than the dinner at Ruth´s Chris Steakhouse due to several reasons. A good colleague of mine approached me, before we entered the restaurant, and told me, that she would like to start the dinner with a cocktail :-) So the two of us grab the seats on a round couch and afterwards informed the other people coming to sit next to us, that we intended to drink cocktails. Luckily the other people were had similar attitude and happily joined us in our cocktail spirit. 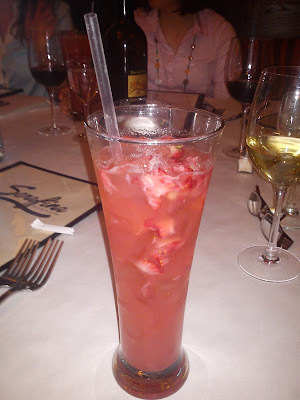 So the entire table ordered a Serafina Champagne Cocktail, which was made from champagne (big surprise having the name in mind ! ), Grey Goose Vodka la Poire, St Germain and fresh raspberries. 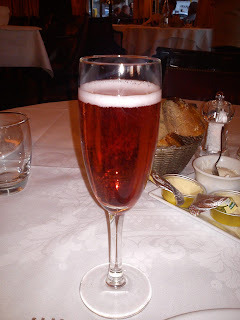 In my drink the raspberries looked more to be strawberries, but the taste was great :-) Any thing with champagne or sparkling wine and you can count me in being a "champagne lady". 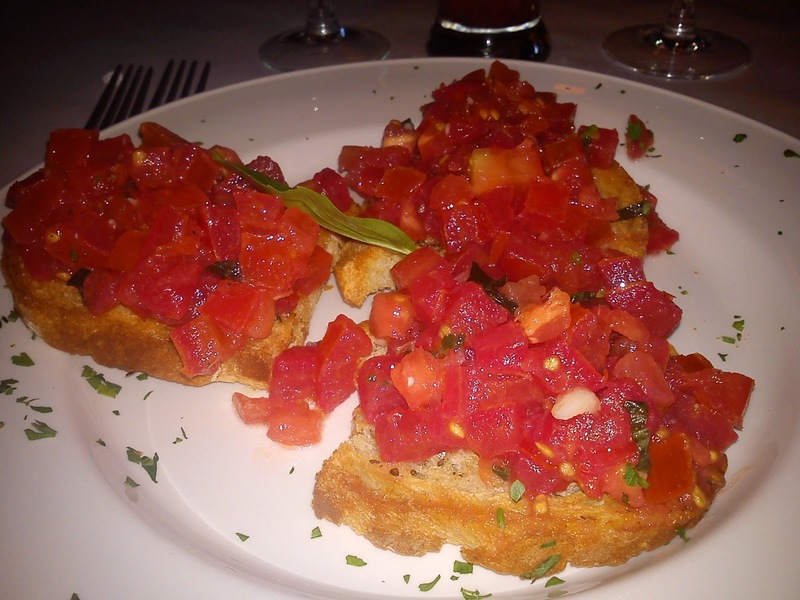 As the non-liquid starter I went for bruschetta. OK taste and as usual in the USA huge portion !!! However, if you have not taken the portion yourself, you are allow to leave some left overs (my own private motto, when I do not finish the served portion). For the main course I was not in doubt at all !!! Risotto "Veuve Clicquot" was selected being a "champagne lady". 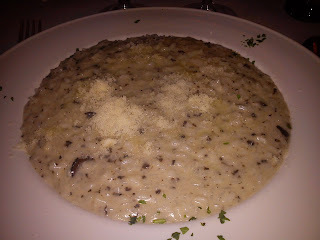 So risotto made with champagne and black truffles. I just love risotto. 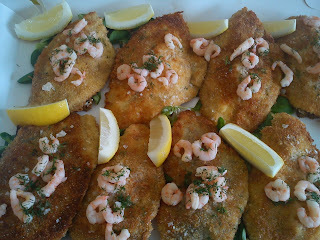 A simple, but very tasty main course. And when I saw the dessert menu card, I knew at once, that I wanted for dessert !!! 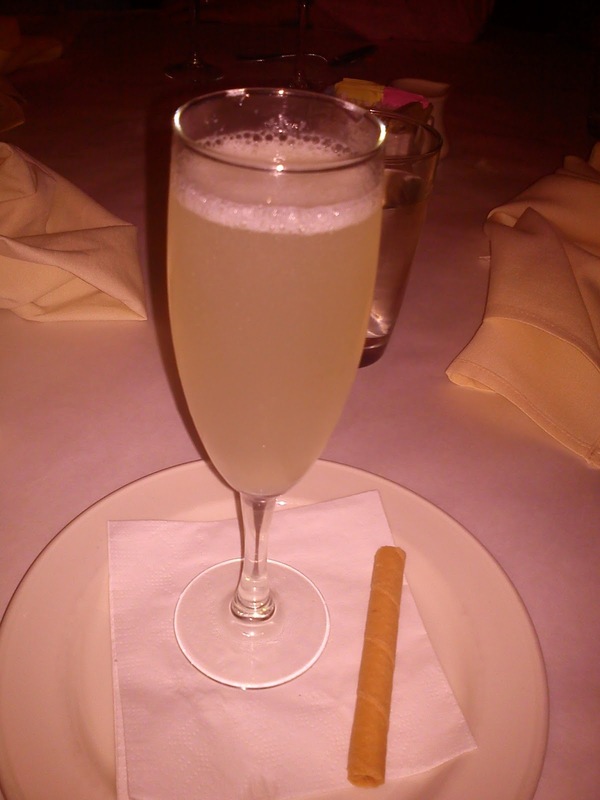 What else than Sgroppino, which is scoop of lemon sorbet, touch of vodka and topped with champagne. So having an entire meal with champagne as important part of both the starter, main course and dessert, was fitting me PERFECT. Combining it with some great company of some very funny ladies and some charming Italian waiters, I had a perfect evening at Serafina. Everything combined I will give the experience 4 stars. Back again at Onkel A (Uncle A) after a great brunch, this time trying a sandwich for lunch after a rowing tour on Vejle Fjord in brillant sun shine. 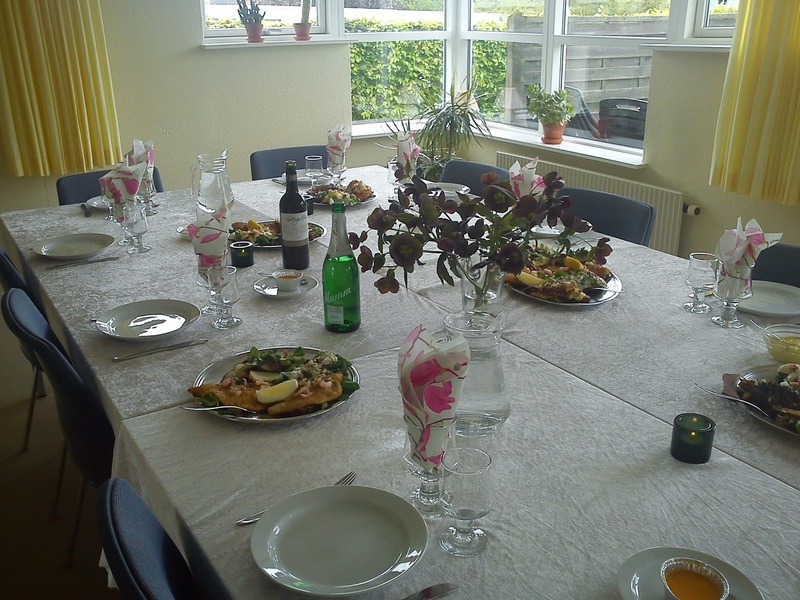 We were two rowers being hungry after 19 km´s rowing, so we decided to eat some lunch together. Our lunch was a sandwich with eggs and scrimps. 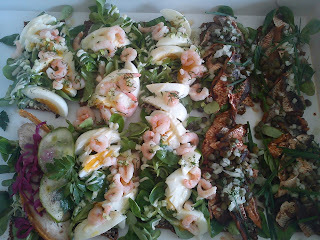 One part of the sandwich brunch was covered with cottage cheese, egg, scrimps, advocado, chives and a sprinkle of curry. The other part of the sandwich bun was buttered with some sort of fresh cheese and slices of vegetable, pear and apple. The sandwich together with a soft drink costed 119 DKK, and I has feeling full in a good way after having eated this sandwich, ready to tackle some garden activities in the lovely sunshine in the afternoon. I have been doing a lot of business travels recently, and therefore not a lot of cooking or baking at home in my kitchen. 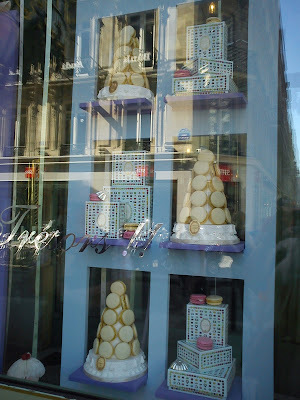 So in period of time I am posting many posts about eating out at various location in France and USA. However, this weekend I decided to celebrate spring time with some blinis served together with smoked halibut (as I am feed up with salmon in general) and asparagus. Warm the milk to finger warm temperature. Add the yeast into the milk and stir well. Add the egg yolk and stir well. Brown some butter on a frying pan. Add a small amount of blinis dough on to the pan. 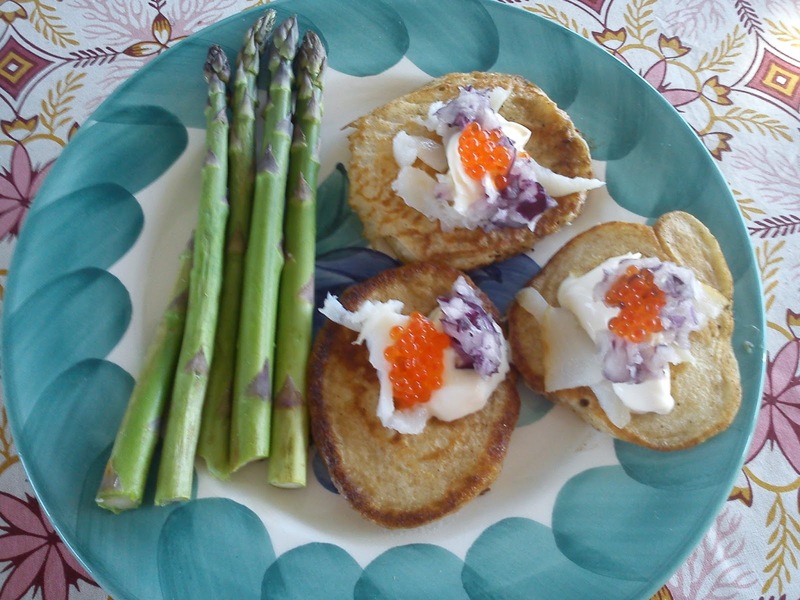 Fry the blinis for 1-2 minutes of each side.